Its beginning to look a lot like Christmas . . . apparently! 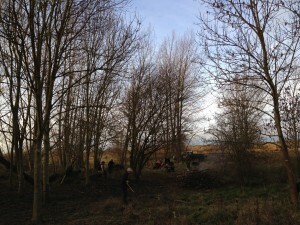 With all this mild weather you could be mistaken thinking it was spring rather than winter but no matter the season or weather the BRVP Volunteers are always at hand for vegetation clearance! 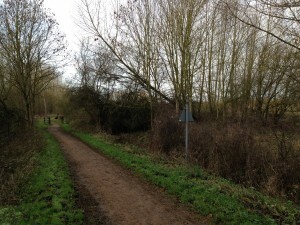 The area that required clearing was located off the Bedford to Sandy cycleway at the bottom of Church End in Willington and involved coppicing leggy Hawthorn and removing hung up and dead poplars. By clearing the vegetation adjacent to the cycleway we hope to improve the surface condition by allowing more light to help dry the surface after prolonged periods of rainfall. The volunteers set to work at the usual rapid pace with bow saws sawing and loppers lopping whilst a hearty fire was set to burn the arisings and to also create embers for the lunchtime sausages that were home made by Robin Braithwaite – and very yummy they were too! After lunch, which involved a number of sausages in buns, mince pies washed down with plenty of campfire tea, the team carried on at a slightly reduced pace! By mid afternoon the light was fading so we called it a day but the team will be back to complete the task in 2016.